This Article addresses an increasingly important question: When, if ever, should foreign citizens be included as members of an American class action? The existing consensus holds that courts should exclude from class membership those foreign citizens whose country does not recognize an American class judgment. Our analysis begins by establishing that this consensus is flawed. 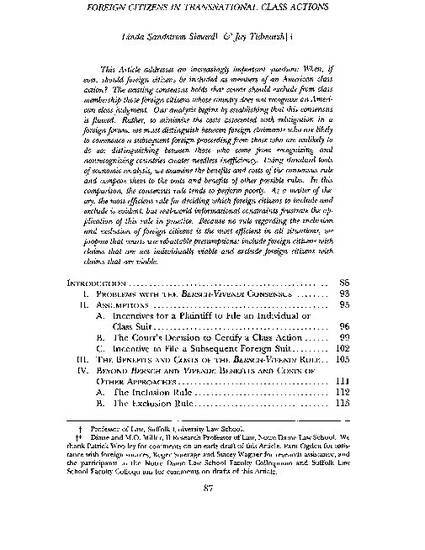 Rather, to minimize the costs associated with relitigation in a foreign forum, we must distinguish between foreign claimants who are likely to commence a subsequent foreign proceeding from those who are unlikely to do so; distinguishing between those who come from recognizing and nonrecognizing countries creates needless inefficiency. Using standard tools of economic analysis, we examine the benefits and costs of the consensus rule and compare them to the costs and benefits of other possible rules. In this comparison, the consensus rule tends to perform poorly. As a matter of theory, the most efficient rule for deciding which foreign citizens to include and exclude is evident, but real-world informational constraints frustrate the application of this rule in practice. Because no rule regarding the inclusion and exclusion of foreign citizens is the most efficient in all situations, we propose that courts use rebuttable presumptions: include foreign citizens with claims that are not individually viable and exclude foreign citizens with claims that are viable. Reprinted with permission of Cornell Law Review.